The Palmero Family Vineyard locale is quite warm and the vines naturally crop at about 2.2 tons to the acre. We have six of the 13 rows here and we pick the fruit ourselves long before normal harvest time when the laborers are readily available. It makes little sense to hire a crew to pick six rows; the personal satisfaction we get from harvesting this special spot is great, although picking does take quite a while due to the small clusters. It takes a lot more work to pick when the clusters are the size of a golf ball! Warm days and rocky soil help create early ripening, small clusters, which brings a concentration of aromas and flavors to the wine while maintaining high natural acidity. 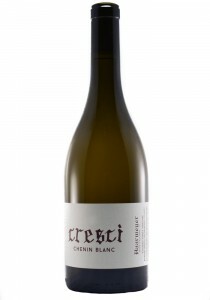 This is crucial to making long lived, complex Chenin Blanc. Ripeness and good acidity are sometimes hard to come by in this part of California.